See a lawyer before you sign. Prenuptial agreements and divorce settlements are both examples of documents that can have important consequences in your life. If you are faced with executing either one, it's a good idea to seek expert legal advice before you sign. Prenuptial agreements are not simply about one person wanting to avoid paying alimony in case of a divorce. In a situation where one or more of the parties are marrying for the second (or a subsequent) time, entering into a prenuptial agreement can make sense. They may want to ensure that certain items normally considered marital property (such as the family home or cottage) pass directly on to their children, as opposed to being subject to division if there is a divorce. It is possible to have a prenuptial agreement overturned by the courts, but this is not an easy thing to accomplish. 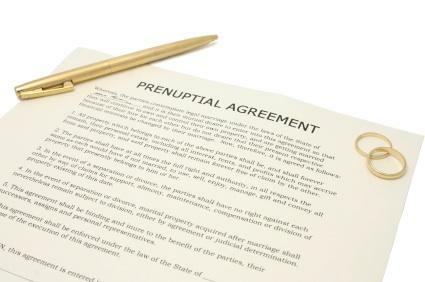 Generally speaking, a judge will not order that the prenuptial agreement be put aside simply because one of the parties decides after the fact that they made a bad deal. Without one of these mitigating factors, it is likely that the prenuptial agreement will be upheld in a court of law. Before signing, each party needs to seek independent legal advice to ensure that they understand the implications of what they are signing. The time to deal with any questions or concerns with a prenuptial agreement is before the document has been signed, not after the fact. If you filed a joint income tax return with your former spouse, you are both responsible for unpaid taxes discovered as the result of an IRS audit. Hire an accountant or a financial planner to make sure that you have filed your information correctly. Take the time to make a detailed budget and an accurate estimate of your expenses. Many people underestimate how much money they need to live on, and end up receiving less than they need to maintain their lifestyle. Use a software program to demonstrate different post-divorce financial scenarios. If you can see how your finances will be affected in the future, you give yourself the information you need to decide whether to accept a proposed settlement or to come back with a counteroffer that is more to your advantage. Keep in mind that any money you receive in your divorce settlement may be subject to income tax. Being offered a lump-sum payment instead of monthly alimony payments may seem like a good idea at the time; you get all the money up front and then you don't have to wait for your former spouse to make payments. However, if you have to pay taxes on that lump-sum payment, you are only going to walk away from the transaction with a percentage of what you thought you were agreeing to. You really need to get expert advice before you sign off an agreement affecting your marriage. Prenuptial agreements and divorce settlements are too complicated to enter into without making sure that your best interests are protected.